Semiconductors enable most of the innovations in vehicle development and are the catalyst for the growth which is driving consumer demand. The modern car contains features like cell phone integration, heads-up displays, autonomous driving aids, comfort, and performance. As cars become even more complicated, demand for automotive semiconductors will increase steadily and provide a powerful long-term growth engine for the automotive industry. Electrification - Virtually all major automotive manufacturers are developing electronic vehicles which requires advanced electronics that extend the range of the vehicle, manage rapid charging and more. Digital Connectivity – Cars are now differentiated by the integration with mobile devices and are in essence – large Internet-of-Things (IoT) devices. Autonomous Driving – manufacturers are equipping vehicles with safety electronics that assist the driver to stay in the lane, watch for objects when backing up and ultimately provide full autonomy (level 5) where there is no driver involved in directing the vehicle. The amount of data and the rate that it must flow around an autonomous car is enormous because the vehicle is measuring most of the space and objects around them. Sensors enable full autonomy, requiring new innovations and advanced processing. Car Sharing – we all know about Zipcar and for those who live in the city, many consider buying a share of a car. Apple recently filed a patent for a programmable license plate. Imagine walking up to a shared car, opening and starting it with your cell phone so that the license plate, insurance changes to your credentials. Safety practices are becoming more regulated as industries adopt a standardized set of practices for designing and testing products. ISO 26262 addresses the needs for an automotive-specific international standard that focuses on safety-critical components. ISO 26262 is a derivative of IEC 61508, the general functional safety standard for electrical and electronic systems. As in similar and parallel industries, Intrinsix adapts it’s engineering and project management approaches to the standards required (such as ISO 26262) for each market in order to achieve verifiable compliance and documentation. Every standard requires specific design and documentation practices at the lowest level of chip design and maintaining those practices to the higher-level system components so they remain compliant. Intrinsix has applied its experience and IP from commercial and defense electronic development to the automotive market and this is evident in the company’s patent portfolio. The development activity with our customers span each of the segments of growth for the automotive semiconductor market as described by the McKinsey study. Intrinsix worked with a major semiconductor company to design a quadrature bandpass sigma-delta converter with very low power dissipation to digitize the signal from the gyroscope. This very low-power design also delivered very low noise enabling a very high sensitivity for the active suspension system. Intrinsix developed the verification plan and verified the core imaging processor and sub-system for a DLP technology based heads-up display chipset. Intrinsix developed the entire digital and analog design, and mixed-signal verification for an angle position sensor. The tangent applications of the sensor included Electronic Power Steering, Lateral Acceleration Sensor, Throttle Pedal, Braking, Transmission and Ride Hight end IC products. Intrinsix developed the ADCs and Digital circuitry, as well as performed the overall verification of a pressure sensor core to be used in Exhaust, Thermal, Powertrain, Refrigerant, Oil, Fuel and Ignition Systems. Other variants will be used for Cabin pressure, Occupancy Detection and Tire Pressure designs. Intrinsix designed all digital circuitry and DACs for a 2 channel DAC to interface and drive a 4 channel PWM power amplifier. Intrinsix modified and integrated other existing IP including interpolation filter, time division multiplexed I2S streams, I2C control blocks. This design implemented sigma-delta based ADCs and DACs. The DACs were integrated into Class-D qualified amplifiers providing full 16-bit signal to noise performance at the speaker. This design provided high-linearity and high-efficiency for crystal clear audio reproduction in the vehicle. A fully programmable audio DSP for enhanced sound processing was developed for a major semiconductor manufacturer targeting the automotive market. The hardware architecture implemented audio processing algorithms which supported sample-by-sample and block-by-block paradigms that could both be executed simultaneously within the signal processing flow. Intrinsix provided design, verification, DFT, and physical design for this customer’s leading-edge audio DSP chip. Automotive Applications are a significant part of the market for the 3 generations of chips we developed for this significant semiconductor supplier: they include: ignition systems, speed controls, security systems, alignment controls, mechanical limit switches, pushbutton switches, tachometer pickups, position detectors, selector switches, rotary encoders, and brushless DC motor commutators. Intrinsix provide digital design and verification along with DSP algorithms and also developed a SENT controller for this customer. Intrinsix integrated sigma delta A/D converters and companion band-pass filters so that the ECU can “hear” each element of the engine operation and separate them so the timing can be controlled electronically. The engine control sensor interface of the main engine control CPU connects to up to 22 sensors (8 different types) to provide a single chip sensor interface design. Intrinsix worked with several of our partners to create supporting circuitry and ICs containing accelerometers and gyros for automotive and virtual reality applications. These included Low G and high G accelerometers. Crash sensing and digital transmission system control are just two of the application spaces that use this type of accelerometer. Among the many technologies needed to construct fully autonomous driving systems - sensors play a central role. They are the eyes and ears of the car, allowing it to build an accurate model of its surroundings from which driving decisions can be made. 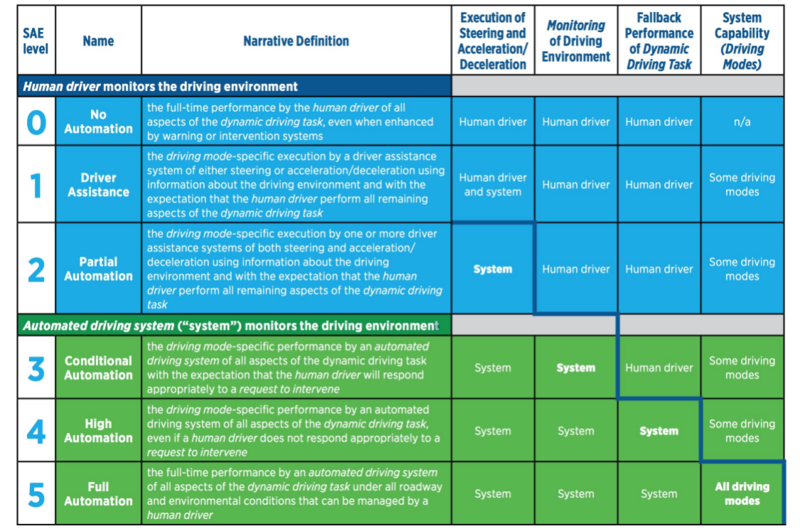 At Intrinsix, we believe that sensors will play an enabling role in achieving the ultimate goal of autonomous driving - fully driverless vehicles, as defined by SAE Level 5 operation (see box below for a discussion of the 6 levels of autonomy). Through a combination of patents and technology partnerships, we are developing a new type of sensor that will change the game in machine vision for autonomous vehicles. The five levels of autonomy courtesy of SAE International. Intrinsix brings the strength of its Platforms, Process and People to bear on the most complex and time-critical integrated circuit design projects for many industry segments, including the Automotive market as you can see from our experience outlined on this page. We maintain expertise and state-of-the-art tools across all major design service domains. If you would like to discuss your automotive semiconductor project, please request a Project Exploration Consultation and we would be happy to help you. For additional LiDAR information please email to lidar@intrinsix.com.